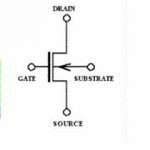 The construction of junction field effect transistor (JFET) is shown in above figure. 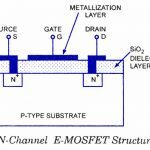 The junction field effect transistor (JFET) in which the electrons as majority charge carriers due to this only current conduction takes place is known as N-channel JFET. 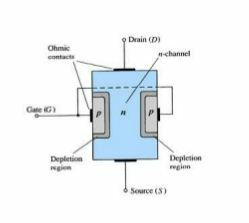 The N-channel JFET consist N type semiconductor that is silicon bar with two P type heavily doped regions distributed on opposite sides of its middle part. The two PN junctions are form by P type regions and the space between the junctions that is N type regions is known as a channel. 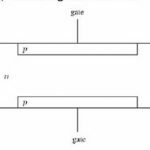 A single wire is taken out in the form of a terminal when both the P type regions are connected internally is known as the gate (G). 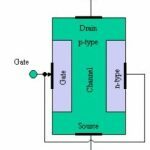 The electrical connection which is also known as ohmic contacts are made to both ends of N-type semiconductor and are taken in the form of two terminal called as source (S) and drain (D). 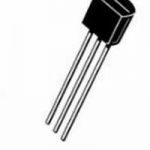 The electrons enter the semiconductor through the source (S) terminal and the drain (D) terminal in which the electrons leave the semiconductor.